The Walk In Freezer -20 Degree from Weiber are designed to provide and sustain highly stable low temperature environments for the storage and preservation of blood cells, plasma, vaccines, microbial cells and other temperature sensitive materials. These equipments offer flexible cold room solutions for highly versatile applications and find widespread usage in scientific research organizations, medical centres, blood banks, pharmaceutical industries, food processing industries and various other industrial and research units. They are available as easy to assemble, fabricated units, designed to provide optimum and consistent working temperature throughout the cold storage chamber. The Weiber Minus 20 Degree Walk In Freezer are available in various standard sizes and can also be custom-designed to suit specific requirements. These compact and energy efficient cooling equipments are designed for maximum space saving and reduced power consumption. They feature a stainless steel construction with highly resistant and non-corrosive external and internal surfaces made up of mild steel and stainless steel sheets. The equipment uses PUF insulated panels of varying thickness, sandwiched between the external and internal walls for increased thermal efficiency. The units use cam-locking arrangement for firm joining and proper alignment of the ceiling, walls and floor panels of the cold room. The aesthetically engineered, PUF insulated doors of these cold rooms feature door locks with hydraulic closure for increased shock resistance and trouble-free, long lasting operation. The Walk In Freezer from Weiber are also available as modular structures that use flexible panel sizes for maximum space utilization. The equipment features sealed panel joints for leakage proof operation and smooth, easy to clean surfaces. 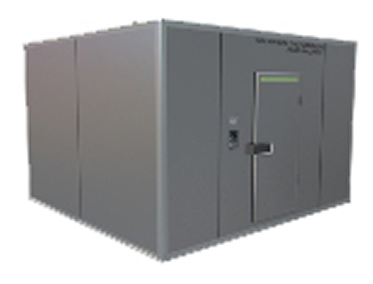 The -20°C walk-in cold rooms use highly efficient and cost-effective refrigeration units comprising of hermetic or semi-hermetic air cooled compressors and non-CFC refrigerants for efficient refrigeration control. The refrigeration units are compatible with the structural design of the PUF panels and are independently controlled for increased efficiency. The doors of the cold room also work independent of each other, providing complete flexibility in terms of storage area. The equipment is fitted with aesthetically designed electrical fittings and control buttons that add to the convenience and overall design of the cold room. The -20°C walk-in cold rooms from Weiber use microprocessor based controllers for highly precise and accurate temperature control. The units are also provided with high quality lighting fixtures for adequate illumination of the interiors. The totally sealed lighting fixtures help in maintaining the ceiling integrity and prevent any infiltration of external contaminants within the storage area. The walk-in cold rooms may also come equipped with easy to clean, removable shelves for segregation of the storage samples. They come equipped with an integrated digital display and data loggers to allow continuous monitoring of the equipment. They might also feature PC and internet connectivity, allowing remote access of the unit via internet. The -20°C walk-in cold rooms from Weiber are designed in accordance with international standards and bear CE certification for quality and safety. Their structural integrity and rigidity allows them to withstand the rigors of such extreme temperature environments, while maintaining highly stable operating conditions.